Submitted by Julia Schwartz on June 17, 2017. 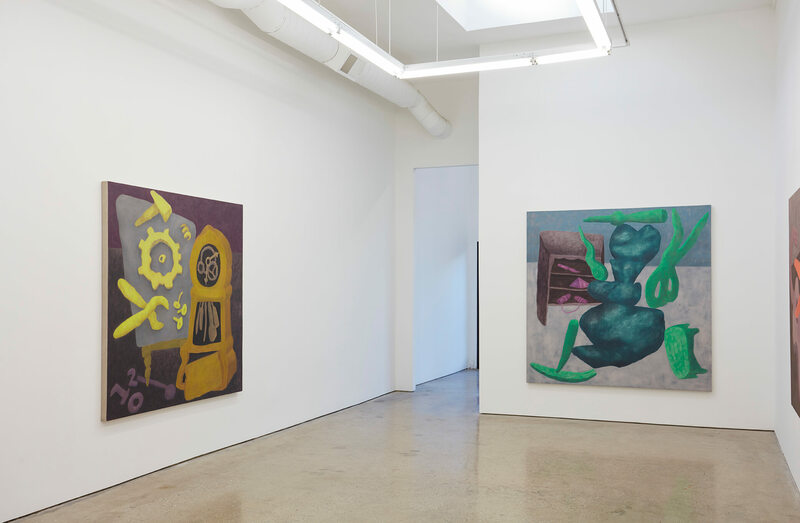 Ginny Casey: Built From Broke is on view at Mier Gallery, Los Angeles from June 10 – July 14, 2017. 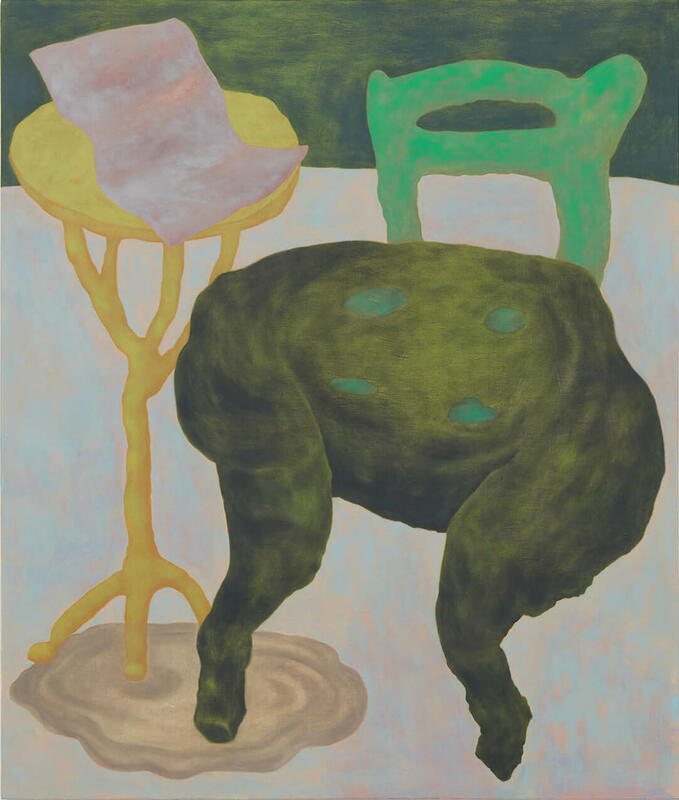 Brooklyn artist Ginny Casey paints forms that she would have made if she weren’t a painter, and places them in spaces that are not of this world. 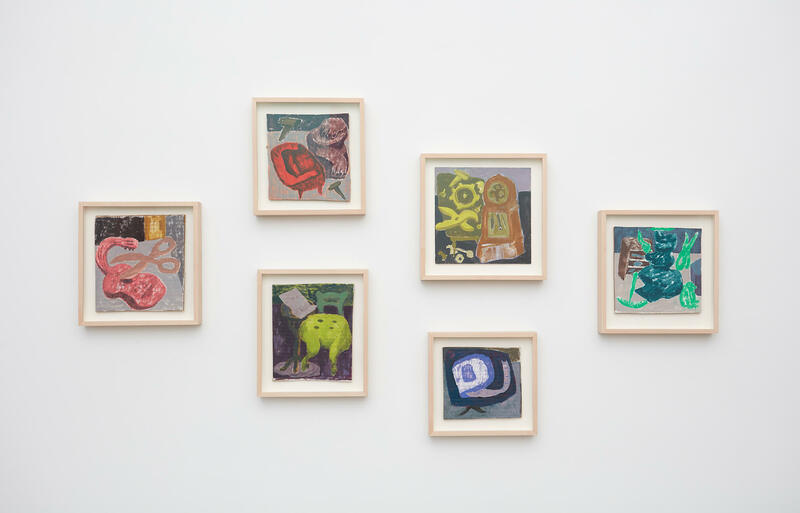 “Built From Broke” is her first solo show at Mier Gallery and includes six oil paintings as well as small studies for the paintings which are painted on cardboard. 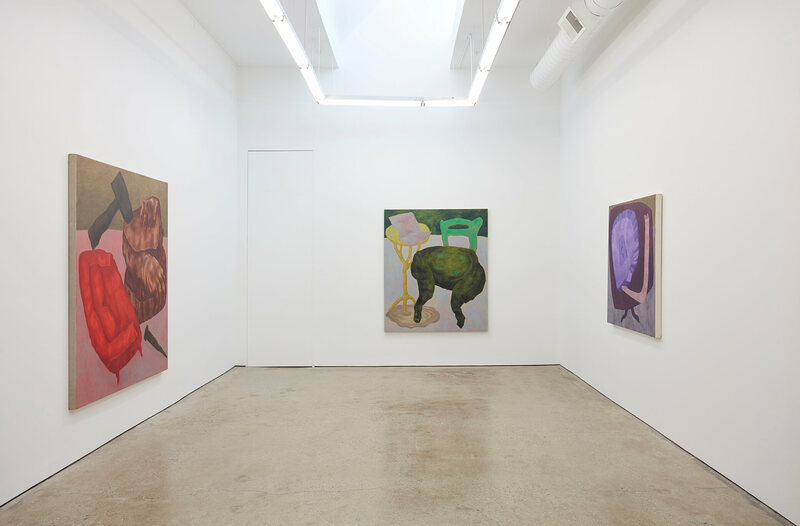 In these close-up interiors, perspective is skewed, the surface is flat, colors are dreamy, recalling Frederick Hammersley or Milton Avery. Objects float, often times small objects looming over the furniture on which they sit, or rather are suspended. The paint handling is soft; the surface of the linen is rubbed or scraped flat and smooth, but the color is dappled rather than flat, which lends a slightly nocturnal or surreal cast- these may have been painted by day but they were conjured by night vision. There’s also an ingredient often lacking in the homogenized “product” frequently exhibited in galleries: a kind of authentic commitment to painting something that exists in the invented space of Casey’s mind; it comes across more like documenting something rather than inventing it, and it is this quality that gives her work sincerity and clarity of vision. 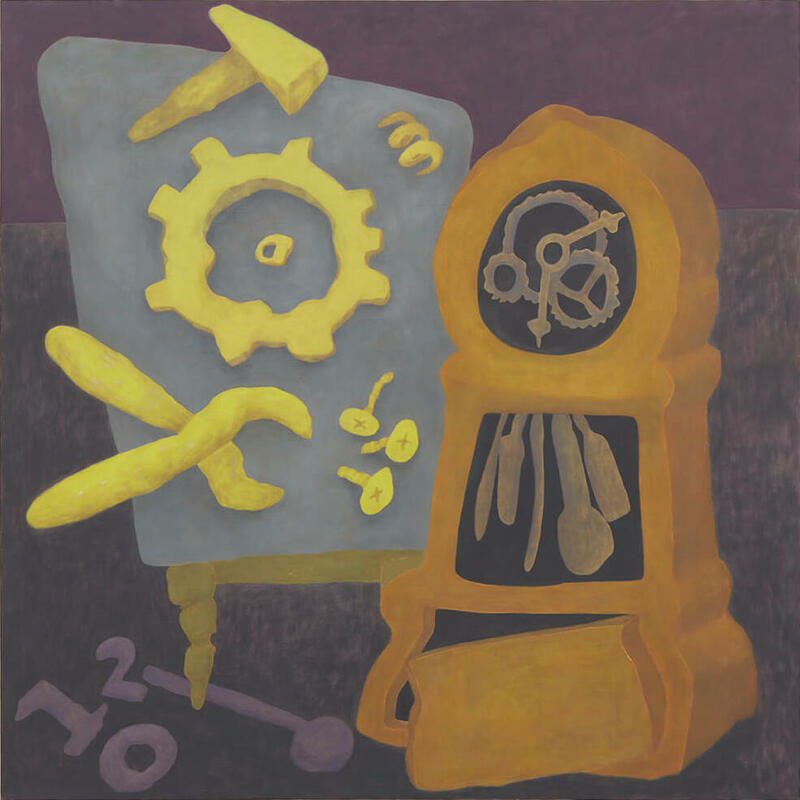 In Adjusting Time, an olive green grandfather clock stands partially dismantled, with citron yellow tools, springs, and screws floating above a table nearby, errant numbers strewn on the floor. There are 5 blades or tools – palette knives, spoons (instead of a pendulum), or maybe this is one blade in motion and we are meant to understand that time keeps moving even when you take the clock apart. 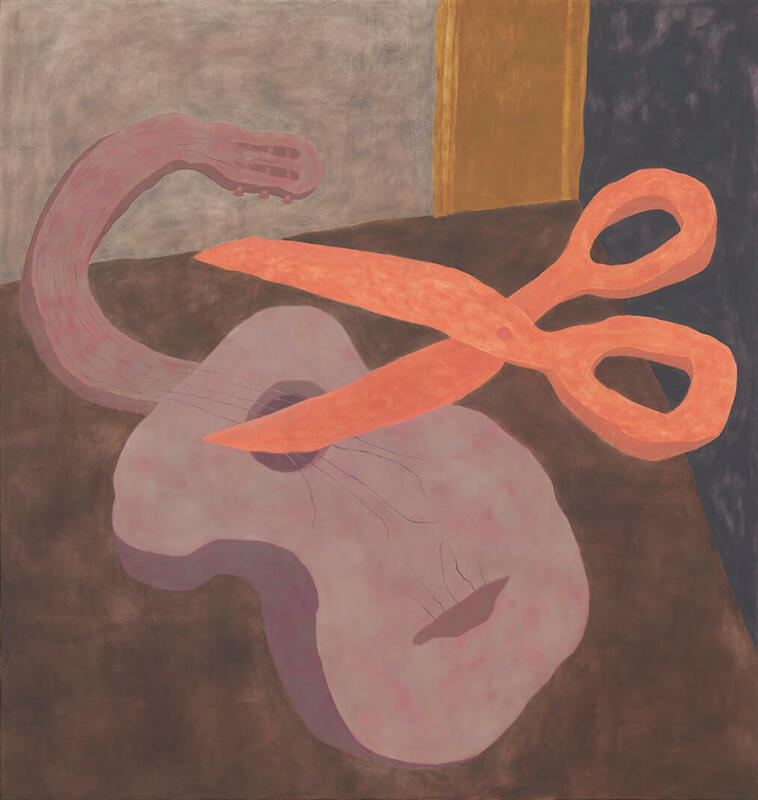 In several paintings, scissors or other pointed objects suggest danger or menace as well as the activities of an artist’s studio. 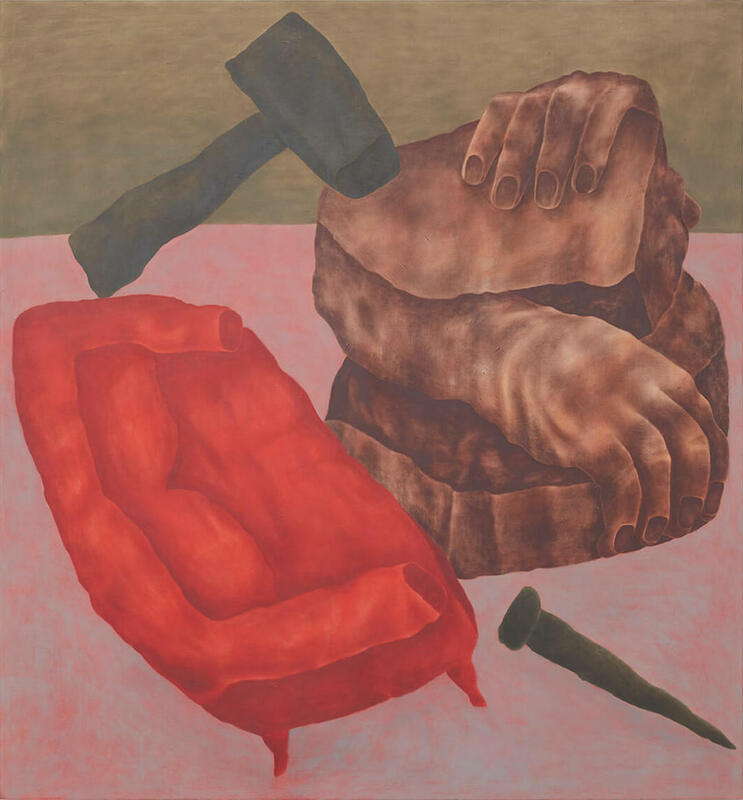 In Couch and Carving, a sculpture of head in hands and tools dwarf a red couch. 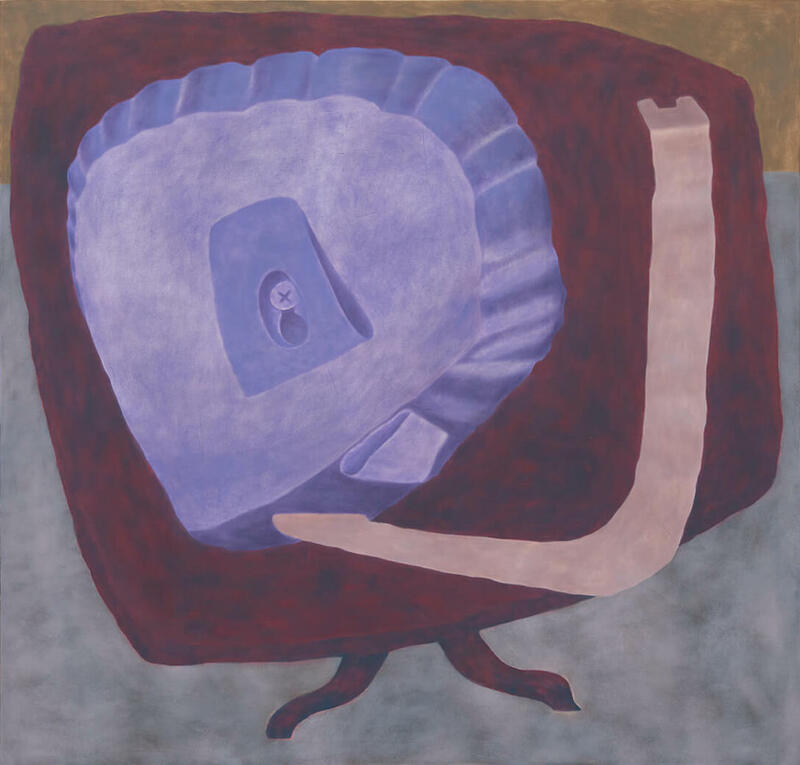 A couch might be a place for reflection, repose, or even analytic reverie, which can lead to transformation much like the transformational impact of making art. Her sense of humor comes through in titles which tend toward a kind of Freudian word play – Blank Tape refers to a measuring tape missing its lines rather than a cassette. In fact, in Blank Tape, Silent Guitar, and Breakup Letter, silence and wordlessness are all in evidence, as though there is more pleasure or meaning in making than in speaking.